Rosie Rat wand or Rosie the Rat wand, Free Shipping, The original Teaser 18 inch safety capped black wand (lncludes shipping) There isn’t a better cat wand toy. The Original Rosie Rat was created in 1964 and has been made over 8.5 Million times that is according to the creator of this wonderful product. Truly time tested. We are excited to include the Original Rosie Rat wand hand made in the USA product. an 18 inch safety capped black, sturdy wand and approx. the wand is 18 inches of cord, with a bell attached. Cats love the Original Rosie Rat wand and we do to because it is handmade with quality material and it lasts and lasts. Don’t be put off by the Original Rosie Rat meek unassuming appearance. Flat as she is, she will delight your cats to no end. 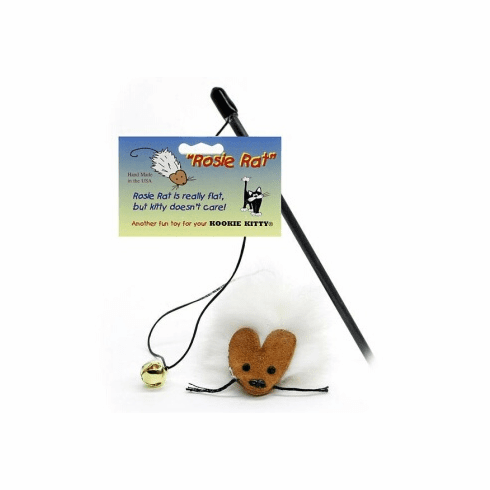 Rosie Rat wand or Rosie the Rat wand, Free Shipping There isn’t a better cat wand toy. The Original Rosie Rat was created in 1964 and has been made over 8.5 Million times that is according to the creator of this wonderful product. Truly time tested. We are excited to include the Original Rosie Rat wand hand made in the USA product. an 18 inch safety capped black, sturdy wand and approx. the wand is 18 inches of cord, with a bell attached. Cats love the Original Rosie Rat wand and we do to because it is handmade with quality material and it lasts and lasts. Don’t be put off by the Original Rosie Rat meek unassuming appearance. Flat as she is, she will delight your cats to no end.